MIAMI GARDENS | Earlier this year in China, scientists inserted new genes into the human genome. In the U.K., clinicians are swapping the cellular nucleus of one woman into the eggs of another woman. “Experiments that were science fiction a few years ago have become a reality in the lab and the clinic today. But the question still remains: Should they be done or not?” says Father Alfred Cioffi, assistant professor of biology and bioethics at St. Thomas University, which is sponsored by the Archdiocese of Miami. 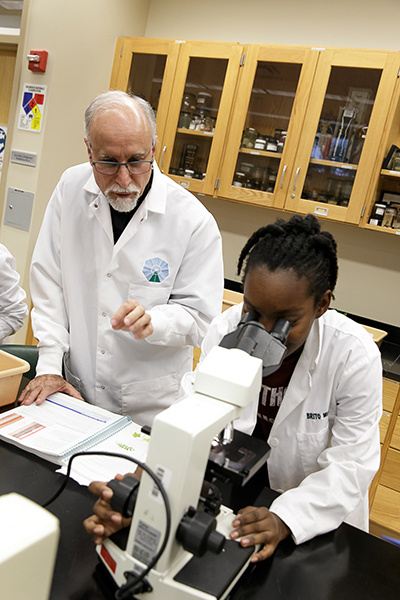 Father Alfred Cioffi helps students conduct biology experiments during a lab class at St. Thomas University. Beginning this fall, the university will offer a master's in bioethics aimed at helping laity and clergy understand and explain Catholic teachings on complex moral issues facing humanity such as cloning, interspecies experimentation, global warming and euthanasia. Other complex issues facing bioethicists today involve in vitro fertilization, human embryonic stem cell research, human cloning, prenatal screening, interspecies experimentation, euthanasia, physician-assisted suicide, transgenderism, global warming, genetically modified foods and rapid loss of biodiversity. Father Cioffi points out that, over the years, the Catholic Church has accumulated a wealth of teachings applicable to issues involving human life and the environment. As recently as last year, Pope Francis wrote the first encyclical entirely dedicated to care for the environment. But the difficulty is conveying this teaching at a level that people can understand it, apply it to their daily life and teach it to others. But that’s just what a new master’s in bioethics being offered by St. Thomas University is designed to do. The program will begin this fall and be offered in four continuous semesters, with two courses per semester for a total of eight courses, resulting in 30 graduate credits. The first possible graduation is set for December 2017. Father Cioffi, who has doctorates in both moral theology and genetics, will oversee the new program. He said the degree was long in the planning stages and the result of local Catholics asking for a program to better enable them to understand, apply and teach Catholic bioethics. “Many people have asked me over the years — and the decades — if they can have a program like this,” Father Cioffi said. “My idea with this program is to empower our laity and clergy to speak and teach competently regarding the complex bioethical issues of our times, and it takes time to go through them systematically, point by point. “Bioethics is an emerging field and it is thoroughly interdisciplinary. It appeals to people working in the sciences and technology, also in the social sciences, theology, philosophy, and religion,” the priest added. The Catholic-based program will be the first in South Florida, Father Cioffi said. He noted that many of the bigger, prestigious universities in the country offer master's or doctoral level bioethics programs, but the classes are usually not grounded in Catholic moral theology. The coursework will cover topics such as fundamental scientific and theological principles used in Catholic bioethics, responsible research, bioethical issues at the beginning and end of human life, health care bioethics, environmental bioethics and biostatistics. “We have come to the point of commercialization of human life. As technology develops and becomes more complex, the issues become more complex. Therefore, we need to engage in the proper bioethical analysis,” Father Cioffi said. At STU, Father Cioffi teaches biology and bioethics, and researches urban forest conservation and solar energy alternatives. He is also associated with the National Catholic Bioethics Center, the Florida Catholic Conference, the Catholic Medical Association, the Knights of Columbus, Catholic Health Services, prison ministry and the respect life ministry of the Archdiocese of Miami. Father Cioffi is also engaged in the dialogue between science and religion: Last November, he flew to Geneva, Switzerland, to participate in the third in a series of international dialogues between science and faith sponsored by the European Center for Nuclear Research (CERN). For more information about the master's in bioethics, call Father Alfred Cioffi at 786-489-9369 or email: acioffi@stu.edu.